What is your favorite color? 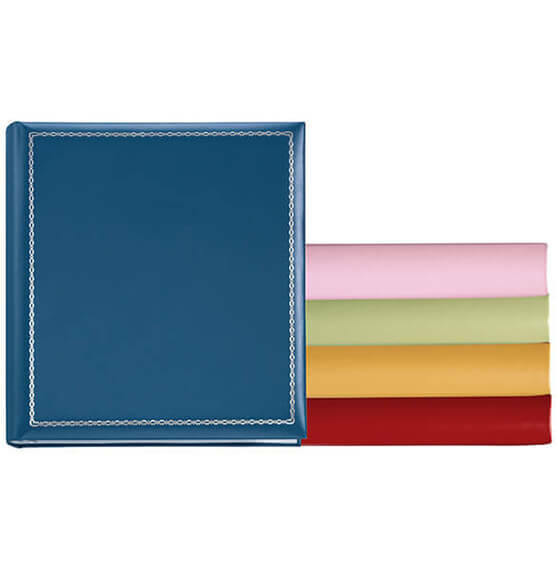 You are sure to find it in this beautiful European bonded leather Felicity photo album. This stylish album is available in fresh, contemporary colors of blue, pink, lime, red and yellow. Mix and match or choose your favorite, the choice is yours. The Felicity design also features silver tooled borders on front for even more eye-popping appeal. Color options make it easy to create theme albums or color coordinate different albums for easy recognition. Three sturdy rings hold up to 40 quality photo pages and it goes nicely with any page style, giving you optimal versatility for photo arrangements. 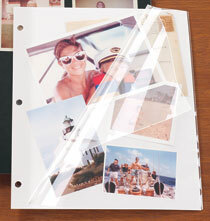 This album offers a fun way to organize all your favorite photos in one place. I have been buying this album for years. I buy a different color for each year, making it easy to retrieve my family photographs easily. Excellent for the 5x7 school pictures. I buy these albums to store our family photos - old and new. I have almost every color. I like how they look on my bookshelves in our office (which is an open room fora ll to see). Sometimes I get them personalized, and sometimes I don't. 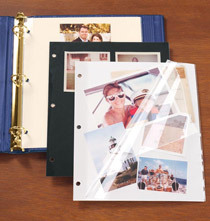 I love them for the 3-ring binder, and their ability to hold tons of pictures! Nice album, simple and elegant. I recommend collecting them! At the sale price, well worth the money. At the regular price, a bit costly. Beautiful album, fairly priced and makes a nice gift. The spine label did not stick to the album. We called in and had another one sent but it did not stick either. The only problem with this album is that they no longer let you choose your photo pages. Why would I want to spend the extra money they charge you for pages I have no use for? They used to sell it for less and then you chose your pages separately. Time to bring that option back!!!! I have at least 10 of these. Nice to see the same product available for all of my photos from the last 15 years. I already own one and need another to match. I wanted to see the quality of this photo album. I hope it holds up as well as the other albums I have purchased from Exposures. I have them already. And I like them a lot. They are very light weight. and the colors are fun. This is a repurchase of a product that works for us. Good quality albums. 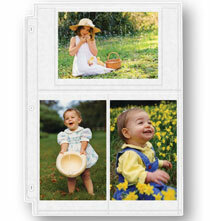 Have been using Felicity Photo Albums for years and is pleased with the product and the Exposures company. I love the flexibility I have with the different photo pages that are available. The quality will endure when being passed down to future generations. Enjoyed the beautiful and variety of colors. Initially there were lots of colors available, now only about 5. I have ordered these albums for my grandchildren's pictures. matches a set i began purchasing years ago. nice to be able to expand. It is oddly difficult to locate photo albums, especially quality photo albums. I have always had good luck with Exposures, so I of course thought of them first when needing to purchase two of them. I have purchased several of these albums in the past and they are a high quality product,. I have purchased Felicity Albums in the past and love them. Wanted a few more for pictures and keepsakes from my grandchildren. They look nice & are inexpensive! This is the 10th Felicity album I have ordered. I'm old fashioned and fill these with photos of my children as they grow. I worry that digital files will get lost or destroyed over time, so this secures the experience. I love these photo albums - i have been purchasing them for my kids every year for the past 15-years! i just REALLY wish they would bring back the other color options aside from blue, red, mustard yellow, lime green and pink! It is the same size as another album I have which you no longer carry and I need a second one. Have used these albums for a long time. 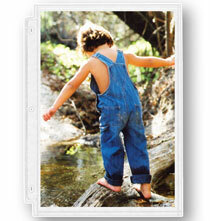 They are a perfect way to keep track of family memories. Good quality albums. Been using Felicity albums for many years and have been very pleased. I ordered these about 10 years ago and now need more. They are high quality and I love the colors! I have run out of my favorite photo albums. 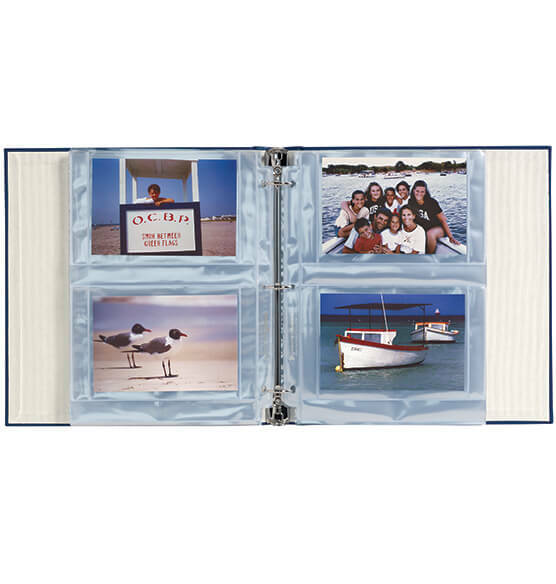 I would NEVER trust any of my most treasured possessions to anything but my exposure albums!! I used these albums before and am very happy with them. I had four albums going for four grandchildren and now need a fifth. So glad that I can still get a similar one. I like the colors and I can add whatever size photos I want. It's very plain, which is what I wanted. I've used many of these albums. High quality and always look nice and hold lots of pictures. Very reliable product. BEST ANSWER: they are 1" or so hard to measure accurately - I have 3 of these albums for my daughter's years in dance and Dance Team. I get the labels later after I see how many years I've gotten into one album. It's fun for her to pick out color. They are easy to use and very nice. Thank you for your question. The ring for any standard size album is 1". The extra capacity albums are 2" rings. We hope this information will be of help to you. 1 brookhaven dr atlanta 30319 how many 4x6 photos does the book hold ? BEST ANSWER: Thank you for your question. It depends on what page style you choose to use in the album. Please look to see how many pictures each page you choose holds. The book holds up to 4 sets of pages, which each set includes 10 pages. That's really hard to say. I checked one of my many Felicity albums and it had 31 pages in it. But some hold two photos, some hold4. full page photo of 81/2 x 11; some for 4 x 6 photos and some for 3 x 5 photos. The ones that come with it are the photo holders which I don’t use so I buy the plain black pages. Are there spine labels for Felicity? BEST ANSWER: Thank you for your question. The spine patch for the Felicity albums are no longer available. Our vendor discontinued making them. We apologize for any inconvenience. No but its easy enough to make your own labels. The albums are well worth it! Is there any example of "Green" which is an option for the Felicity album somewhere shown on the site? The green in the drop down box looks like "Lime"
BEST ANSWER: Thank you for your question. The lime is the album on the far left. The bright green is second from the bottom of the photo. We hope this information will be of help to you. is this available for personalizing the cover? BEST ANSWER: Thank you for your question. Yes please click on this link to view the item https://www.exposuresonline.com/buy-felicity-personalized-photo-album-309188?w=felicity%20photo%20album. We hope this information will be of help to you. When will the brown be available? Thank you! BEST ANSWER: Thank you for your question. There is no brown in this album, what is available are blue, lime, pink, red and yellow. We hope this information will be of help to you. I have started these albums for grandchildren in specific colors for each grandchild. I am learning that I can no longer get this album in black or purple. Why have those colors been discontinued The agent also told me that you will no longer have these albums available, why is that? BEST ANSWER: Thank you for your question. Unfortunately the vendor no longer manufactures this album. We hope this information will be of help to you. Is the color purple available and how many pages are in the album? BEST ANSWER: Thank you for your question. The color purple is no longer available and the album includes one 8x10 page, two 5x7 pages, three 3 1/2 x 5 pages and four 4x6 pages. We hope this information will be of help to you. BEST ANSWER: Thank you for your question. It is a three ring album. We hope this information will be of help to you. Can I trade out the pages that come with this album that I don't want with pages I do? BEST ANSWER: Thank you for your question. Unfortunately we are unable to change the pages that are shipped with the album. We hope this information will be of help to you. What shades of blue and pink are the ones that are for purchase now? BEST ANSWER: Thank you for your question. The pink is from the fourth from the bottom and the blue is the one on top. We hope this information will be of help to you. BEST ANSWER: Thank you for your question. The only colors available are in the drop down box, the rest have been discontinued. We hope this information will be of help to you. Why are all the colors shown for the Felicity album not available to purchase? I would love to see some new colors or more of a selection. BEST ANSWER: Thank you for your question. The colors shown in the picture but not the drop down box have been discontinued. We hope this information will be of help to you. BEST ANSWER: Thank you for your question. That is Light Blue, which has been discontinued. We hope this information will be of help to you. What if I don,t when the pages, is the price going to be the same? BEST ANSWER: Thank you for your question. The pages are sold separately from the three ring album. We hope this information will be of help to you. trying to order this album but brown is not in the pull down menu? BEST ANSWER: Thank you for your question. Brown is no longer available for the Felicity. We hope this information will be of help to you. How many pages does it come with for how many photos? BEST ANSWER: Thank you for your question. The free pages that are included are listed below. This album will old 3-4 sets of 10 pages. We hope this information will be of help to you. BEST ANSWER: Thank you for your question. Unfortunately no, this item does not offer personalization. We hope this information will be of help to you. What are the Felicity albums dimensions? BEST ANSWER: Thank you for your question. The Felicity album measures 10 1/2" wide by 11 1/2" high. We hope this information will be of help to you. BEST ANSWER: Thank you for your question. You can order paged for different size photos. You will need to look at our three ring pages for the styles. We hope this information will be of help to you. Will you have the lavender Felicity album again? BEST ANSWER: Thank you for your question. Lavender is a retired color and we will not be getting it back in. We apologize for any inconvenience. BEST ANSWER: Thank you for your question. At this time the black is not available and do not have a tentative time frame of when it will be available. We hope this information will be of help to you. Why can't I get Burgandy in this album.? The color shows in the picture but not in the choices. BEST ANSWER: Thank you for your question. This album is no longer available in burgundy.